The job of keeping freshwater fishing in South Carolina the best it can be is complex. Loss of habitat, changing weather patterns and competition from non-native species are just a few of the challenges involved, but new research tools and data-driven management strategies are helping the DNR's Freshwater Fisheries Section meet those challenges head-on. Younger anglers may not remember, but South Carolina was once at the epicenter of a bass-fishing revolution. After landlocked striped bass were discovered in the Santee-Cooper lakes system in the mid-1950s, state fisheries biologists began developing culture techniques that have since produced millions of hatchery-spawned striped and hybrid bass, creating thriving fisheries for this popular species in South Carolina lakes and across the U.S. It's an important chapter in the history of fisheries management in South Carolina, but far from the only one. The biologists and technicians working in the S.C. Department of Natural Resources' Freshwater Fisheries Section have at their disposal an array of research and data collection tools that their peers back in 1953 could only have dreamed of. And that's a good thing, because the section is responsible for effectively managing all of the Palmetto State's 159 freshwater fish species against a backdrop of challenging 21st century problems that include threats from habitat loss and changes in water quality, competition from invasive species and the mandate to provide better fishing opportunities for the thousands of recreational anglers (both in-state residents and out-of-state visitors) who are a huge part of our state's growing tourism economy. "Really, it all gets back to three main things," says Freshwater Fisheries Section Chief Ross Self, "rebuilding habitats, restoring populations and providing the best recreational fishing opportunities that we can. That's what we do, in a nutshell." That's one very large nut, and it would be virtually impossible to cover all of the activities and projects undertaken by the Freshwater Fisheries Section in a single article. So what follows is instead an overview of six specific projects, all designed to impact one or more of the three priorities outlined by Self - snapshots, if you will, of the much larger coordinated effort to conserve and enhance all of our state's freshwater aquatic resources. The Palmetto State's native brook trout (Salvelinus fontinalis) is a survivor, but just barely. Prior to the late 1800s, these fish were common in the Blue Ridge Mountain streams of South Carolina's northwestern corner. But flash forward barely a hundred years to the late 1980s, and brook trout faced the very real possibility of being totally wiped out in state waters, their numbers devastated from habitat loss and competition from non-native species. A dire situation, made doubly so because South Carolina's native brookies are a part of a unique strain known as "southern Appalachian" brook trout - genetically distinct from their northern cousins. Intense logging in the Appalachian Mountain region of the United States around the turn of the 19th century stripped the shady cover from many mountain streams, and runoff from logging, mining and associated road construction caused sediment to build up in formerly clear waters. Brook trout might have returned, once the forests grew back and the streams healed, but in the meantime, stocked brown trout from Europe and rainbow trout from the Western U.S. took over much of the brookies' historic range. By modern times, brook trout in South Carolina had dwindled to just a few stubborn holdouts in headwater streams too shallow for larger fish. Today, the DNR's Freshwater Fisheries Section, along with the U.S. Forest Service, Trout Unlimited and other groups, are partners in the Eastern Brook Trout Joint Venture, an effort focused on rebuilding populations to fishable levels through stocking and habitat enhancement. Successful reintroduction of brook trout has already been accomplished in four streams within the Sumter National Forest, and in 2008, the DNR set its sights on restoring brook trout within the 43,000-acre Jocassee Gorges region - the heart of their historic range. Early assessments of headwater streams in the Gorges by biologists like DNR Region 1 Fisheries Coordinator Dan Rankin found that virtually none of the streams there held viable populations. In the early 1990s, Rankin had worked with researchers at the University of Tennessee to help identify the genetic markers used to identify pure southern Appalachian brook trout. "That initial genetic work that included identifying the genetic structure and distribution of brook trout in South Carolina is guiding our current restoration efforts," says Rankin. In 2008, the DNR and its Joint Venture partners began a long-term brook trout restoration project in the Gorges. Job number one was identifying streams with the highest potential, based on factors such as water quality, accessibility and the condition of in-stream and streamside habitats. A comprehensive habitat assessment of all streams in the Jocassee Gorges was completed in 2012, and according to DNR fisheries biologist Amy Chastain, a common deficiency found in many of them was a lack of pool habitat and large woody debris. Teams of DNR biologists, technicians and TU volunteers have begun the task of rebuilding brook trout habitat on Laurel Fork Creek in Laurel Fork Heritage Preserve. Taking advantage of dead and dying hemlocks killed by the hemlock woolly adelgid outbreak, the teams cut and place hemlock logs into streams to enhance cover and facilitate the scour of sand deposits, creating pools. 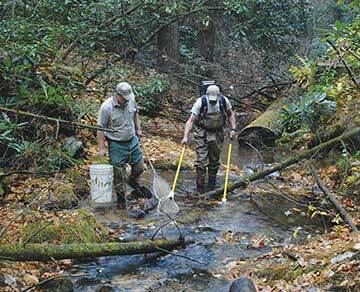 The project will be completed in winter 2013, and brook trout will be stocked in the stream the following summer. Based on similar restoration efforts elsewhere, biologists expect the stream to support fishable populations within five years, and the DNR will rebuild habitats and restore brook trout in more Jocassee streams over the coming decades. "These deficiencies are likely tied to the use of the property for commercial timbering over the last century," says Chastain. Southwest of the Jocassee Gorges, in the fast-moving streams and large impoundments of the upper Savannah River system, DNR fisheries biologists and their colleagues at the University of South Carolina are using cutting-edge genetic research tools to study another native species that has lost ground in recent years - Micropterus coosae, the redeye bass. In this case, the threat comes from hybridization, or interbreeding with non-native species - primarily the Alabama bass, Micropterus henshalli (sometimes mistakenly identified as "spotted bass" by anglers). Members of the black bass family, redeye bass are found in lakes Keowee, Jocassee, Hartwell and Russell, in many of the upper Savannah's tributary streams, and as far downstream as the Augusta Shoals area. The world-record redeye bass was caught on Lake Jocassee in 2001. Though not a well-known species, they are hard-fighting, aggressive feeders that provide anglers with exciting action, according to DNR fisheries biologist Jean Leitner, who's been tracking the redeye's declining numbers since 2004. "They are really quite a lot of fun to catch on light tackle," says Leitner, "and wading and fishing the Upstate streams they inhabit is a beautiful way to spend a summer day." DNR fisheries biologists believe Alabama bass were introduced into lakes Keowee and Russell sometime in the mid-1980s, and the species has spread throughout the upper Savannah reservoirs, interbreeding with and displacing native redeyes. DNA analysis of fish in the black bass family sampled by the DNR in 2004 and again in 2010 confirmed biologists' worst fears - redeye have been virtually eliminated from lakes Keowee and Russell already, and are rapidly disappearing from lakes Jocassee and Hartwell. Through continued research, fisheries biologists hope to discover how far upstream into the tributaries that feed the lakes hybridization has advanced, learn where genetically pure populations of native redeye remain and identify the stream habitats most closely associated with them. Studying the DNA of sampled fish allows DNR biologists like Leitner to pinpoint how far upstream hybrids and non-native bass are occurring. By combining this data with the redeye's habitat preferences, GIS data on adjacent land-use patterns and the structure of tributary streams in the system, they hope to identify upstream areas where they can preserve - or even restore - genetically pure redeye. Many of the inner-piedmont streams that comprise good quality redeye habitat are in private ownership and under considerable development pressure as the region's population grows. Preservation of more high-quality intact stream habitats is needed. The research being done by DNR biologists and their peers has shown that the Savannah River population of redeye bass is a genetically unique strain found only in South Carolina and Georgia. In fact, many of the biologists working on this issue believe it to be an entirely separate species. "What we don't know right now is precisely where our remaining pure redeye populations persist," says Leitner. "We have a lot of confidence that this continued research will reveal that, and that we'll be able to keep this species around for future generations to enjoy." 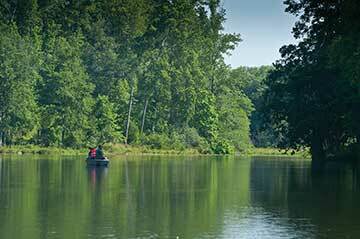 For a great many South Carolina anglers, "going fishing" means heading out to one of our state's big lakes in search of bass, bream, crappie or catfish - or maybe all of the above! 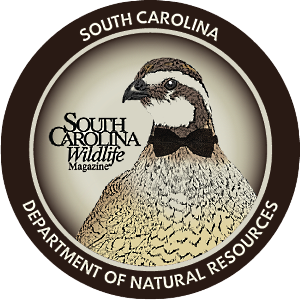 South Carolina boasts fourteen major reservoirs ranging in size from 7,500 to 110,000 acres, all of which provide good opportunities for recreational anglers and a significant economic boost to surrounding businesses and communities. Maximizing recreational fishing opportunities and protecting the long-term health of these fisheries is a top priority for the DNR's Freshwater Fisheries Section. One way that section biologists and technicians approach this goal is through habitat restoration and enhancement projects. Anglers who fish regularly in state reservoirs are keenly aware of the DNR's ongoing program of maintaining fish attractor sites. In the Upstate (Fisheries Region 1), recycled Christmas trees are placed in major lakes on a rotating basis, says DNR biologist Amy Chastain. 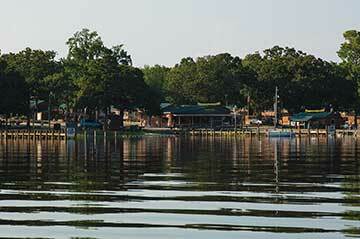 In addition, more extensive work is planned for lakes Hartwell and Greenwood in 2013. "The Hartwell and Greenwood lakes habitat projects will include aquatic vegetation plantings, gravel beds and installation of deep and shallow water habitat structures such as root wads and trees," says Chastain. "We'll also construct a new pier near the DNR's Clemson office to provide better access for shore-based angling." Maintaining fish attractor sites is a regular part of the job for the hard-working fisheries technicians in the DNR's other three regions as well. In 2012, technicians in Region 2 refurbished attractors on lakes Wylie and Wateree using recycled trees. "Christmas lasted for three months," says Region 3 fisheries technician Drew Robb, regarding that region's habitat enhancement efforts, which also took advantage of recycled trees - more than 450 were sunk at fifteen different locations on Lake Murray alone. 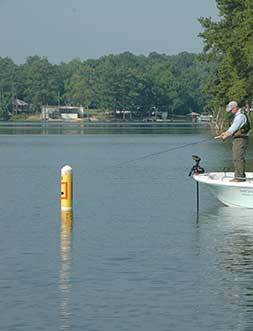 Fish attractors in lakes Marion and Moultrie received similar attention in Region 4 in 2012. In addition, staff installed rock gabions near an island in Lake Moultrie as part of a shoreline restoration project. Maps and GPS coordinates of all DNR-maintained attractor locations can be found on the agency's website at www.dnr.sc.gov/fishing. The blackwater rivers that meander through South Carolina's coastal plain provide an inviting place for anglers to drop a line into tea-colored waters to catch dinner or just pass a lazy afternoon. 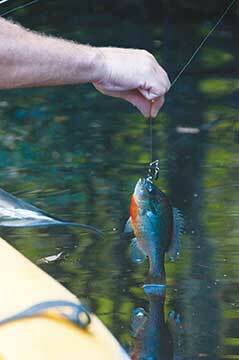 The Edisto River, in particular, is almost synonymous with redbreast fishing. Generations of anglers have bragged about pulling hefty stringers of these feisty members of the sunfish family from the Edisto's shadowy pools. Unfortunately, since the early 1990s, redbreast fishing on the Edisto has been in decline, and many anglers have placed the blame for their decreasing catches squarely on the flathead catfish, a non-native predator that can weigh more than one hundred pounds. While this species has a well-earned reputation for devouring sunfish throughout its native range, DNR fisheries biologists are finding that flatheads aren't the only thing affecting the redbreast fishing holes along the Edisto. As a first response to the waning redbreast numbers, in 1995 the DNR, in partnership with the U.S. 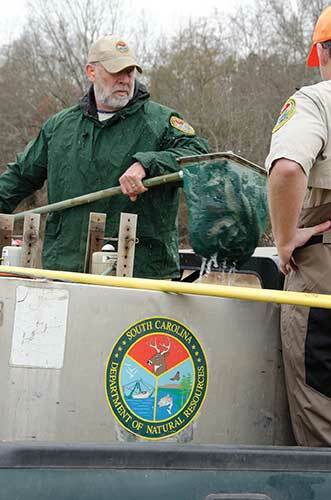 Fish and Wildlife Service, began stocking redbreast fingerlings from the Orangeburg National Fish Hatchery into the Edisto, a practice that continues to this day. As a second step, state regulations concerning set hooks were changed, for the Edisto and some other coastal plain rivers, to allow the use of live bait to target flatheads. But these efforts seemed to bear little fruit, and redbreast populations remained suppressed. Then, in 2002 and 2003, something happened that gave biologists a clue to the mystery; it started to rain. It rained so much that the Edisto River system remained flooded for about nine months. The following year, redbreast fishing was great again. Biologists quickly realized that at about the same time the flatheads started showing up in the Edisto, a cycle of persistent droughts throughout the Southeast began that is ongoing today. "What we are seeing," says Fisheries Section biologist Chris Thomason, "is that the redbreast's habitat is directly affected by drought. Without flooding in the swamps, important nutrients are not brought into the river. As the food supplies for redbreast have dropped during periods of drought, catches have declined." Now the goal is to assess how much stocking hatchery redbreast is helping the situation. Beginning in 2010, Freshwater Fisheries Section staff began marking redbreast fingerlings reared at the DNR's Cheraw and Cohen Campbell hatcheries with oxytetracycline to stain their otoliths (ear bones). These marked fish are part of a study that will provide critical information about how stocking affects the overall redbreast population - a question that states in similar situations are also anxious to have answered. The Edisto River is the longest undammed floodplain blackwater river system in North America, which creates another unique challenge. "Because it is completely undammed, we can't artificially restore habitat by increasing water flows," says Thomason. "So this study is really our best hope to learn how we can have a positive impact on the fishery. Early results show that stocked fish are surviving and growing, but it appears that the drought cycle continues to stress [both stocked and naturally reproducing] redbreasts." The largemouth bass is South Carolina's most popular freshwater gamefish, and the DNR pays a great deal of attention to monitoring and managing this species. Tournament fishing by national and local bass fishing clubs is a popular and growing activity, with tournament-style bass fishing even finding its way to middle and high school bass fishing teams. "Right now, there are twenty-three such teams and the number is growing rapidly," says DNR Aquatic Education Coordinator Lorianne Riggin. Every spring, fisheries biologists monitor the status of largemouth populations by electrofishing in lakes and reservoirs on a rotating schedule. 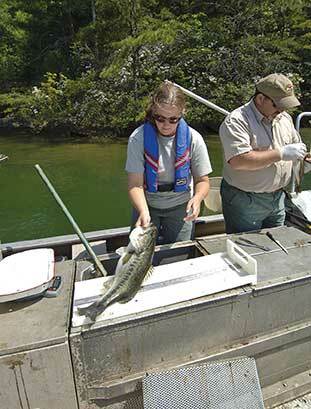 Such monitoring provides information on the many factors that influence the largemouth fishery, such as abundance, size, growth and mortality, and the data collected is used to refine the DNR's management strategy for each river or reservoir within the state. For instance, monitoring data collected over a period of time showed that major reservoirs in the Savannah drainage were less productive than others in South Carolina. So, Savannah drainage reservoirs now have a twelve-inch minimum size limit, compared to a fourteen-inch limit on the state's other major reservoirs. Other bass-fishing regulations have also been tweaked as a result of ongoing monitoring and research by Freshwater Fisheries Section biologists. As always, the goal is to optimize fisheries to produce quality largemouth. Biologists believe the potential exists to produce even larger numbers of quality bass in some South Carolina reservoirs, especially the Santee-Cooper lakes. In the case of this species, stocking likely isn't part of that equation. In recent years, DNR biologists have investigated the stocking of hatchery-produced largemouth bass fingerlings to improve populations in large reservoirs. Not surprisingly, what they found is that the natural reproduction of bass generally exceeds what the reservoir can support, and natural spawning is all that is needed to produce and sustain a good largemouth fishery. 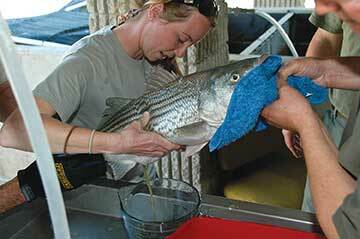 Annual sampling conducted by the DNR in the early 2000s confirmed what many longtime anglers on the Santee-Cooper lakes had suspected - the lakes' world-famous striped bass fishery was in decline. Populations reached an all-time low around 2004, a period of sustained drought in the Southeast. Recreational fishing plays an important part in the economy of the region, and for many of the communities surrounding the lakes, the decline of striper fishing was an important economic issue. DNR fisheries managers brought those communities into the process of addressing the problem by forming a public stakeholder group to review all of the available scientific research and develop a striper recovery plan. Stakeholders recommended a twenty-six inch minimum size limit designed to allow female stripers to reach reproductive size, and a June through September closure of the fishery to reduce catch-and-release mortality during the summer months. The South Carolina General Assembly approved these changes in 2008. Fortunately, the success of natural spawning and stocking was high in 2008, creating an immediate opportunity to build up populations through continued stocking, coupled with the new regulations. The success of natural spawning and hatchery stocking is highly variable from year to year. However, annual monitoring has shown that the number of stripers in the Santee-Cooper system has continued to increase since its low point. Adult mortality has declined substantially since the new regulations were adopted, and in 2012 the catch of four-year-old fish from the 2008 spawning and stocking was the third highest on record. During the recovery period, the DNR has continued to improve its stocking efforts and gather information that will help sustain the recovery of the striper fishery. Genetic marking of hatchery-stocked fish allows fisheries staff to determine the relative contribution of fish from natural spawning and hatchery stocking. 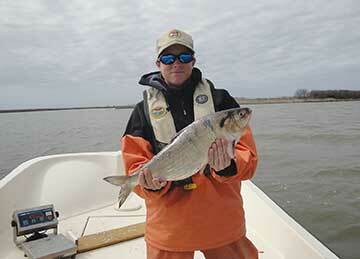 Many Santee-Cooper fishing guides are enthusiastic about the recovery efforts so far. Anglers are catching lots of stripers, but only a small percentage are larger than the new minimum size limit. "I think the next couple of years are crucial to accumulate females of reproductive size," says Region 4 Fisheries Coordinator Scott Lamprecht. "In 2015 we can take another look at the population's status and perhaps even revise harvest guidelines so that more harvest can occur." Diadromous is a scientific moniker that refers to two distinct but similar groups of fishes: anadromous, those moving from saltwater to freshwater for the purpose of spawning, and catadromous, which do just the opposite, moving from freshwater to saltwater to spawn. South Carolina's anadromous fishes include the American shad, hickory shad, blueback herring, Atlantic sturgeon and shortnose sturgeon, all of which return to the river in which they were born to spawn. The lone catadromous fish swimming in Palmetto State waters is the American eel. During the last century, the construction of dams on many major rivers in South Carolina blocked or fragmented much of the spawning habitat used by diadromous fishes. 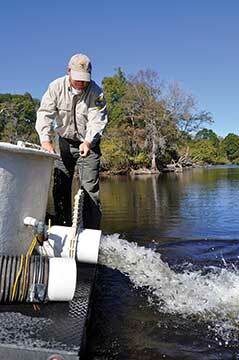 A DNR-operated "fish lift" at the St. Stephen Dam in Berkeley County allows migratory fish like American shad and blueback herring to move upstream from the Santee River to lakes Moultrie and Marion and into the Congaree and Wateree rivers during their annual spawning migrations. The facility can pass as many as 400,000 shad and 500,000 herring in a given year. The fisheries biologists and technicians assigned to the DNR's diadromous fish research project sample these species on an annual basis. Crews gather critical biological information by capturing, measuring and tagging American shad and blueback herring during their spring migrations up the Santee and Waccamaw rivers. Scale samples are also taken to assess aging. In the fall, juvenile shad are captured and examined to determine yearly recruitment, the amount of young fish produced in the Santee Basin and the Great Pee Dee, Edisto and Savannah rivers. 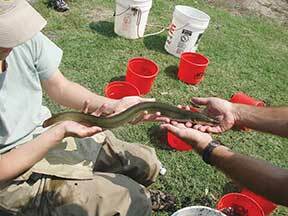 A similar program is conducted for the American eel. 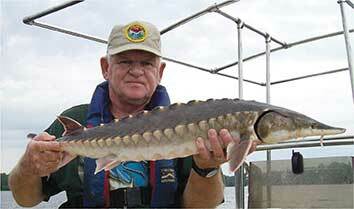 As part of a multistate effort with Georgia and North Carolina, in 2010 the DNR began studying the behavior of shortnose and Atlantic sturgeon in the Southeast. This effort involves the use of a piece of high-tech equipment called a hydrophone that allows scientists to track the movements of individual fish. In this study, adult shortnose and Atlantic sturgeon captured using gill nets were tagged with transmitters, each with a unique code, and released back in the water. 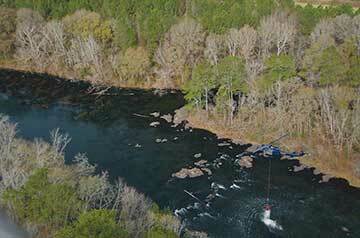 More than six hundred hydrophone receivers capable of receiving signals from the tagged fish were deployed in major river systems in South Carolina, Georgia and North Carolina. During the past two years, DNR scientists have documented behavior that sheds new light on the migratory patterns of these species. Both species of sturgeon are endangered, and better understanding their behavior, migration patterns and life history is critical if their populations are to recover. Information generated by this study is useful not only to fisheries biologists, but also for agencies that need to determine how activities such as dredging in coastal waters, maritime construction and relicensing activities of hydro-electric facilities will affect these species. The men and women who manage our state's freshwater aquatic resources are trained scientists who take a practical approach to the conservation of one of our state's most important and valuable natural resources - our freshwater fisheries. 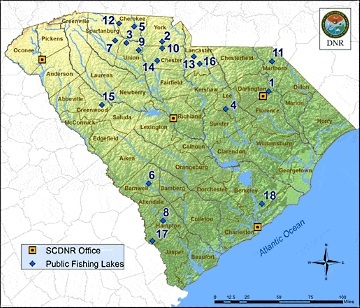 The research, management and restoration projects described in this overview represent just a small portion of the totality of the work done by the DNR's Freshwater Fisheries Section on behalf of South Carolina citizens each day - projects that range from tracking the abundance of American eels in major coastal river systems to assessing the health and habitat of small watershed streams across the state. This work is important. 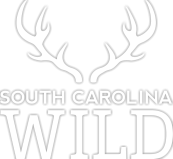 It benefits (and is primarily funded by) anglers, through their license dollars and purchases of fishing equipment, but it is also of critical importance to all South Carolinians who value clean water, better opportunities for outdoor recreation and a vibrant, growing state economy. 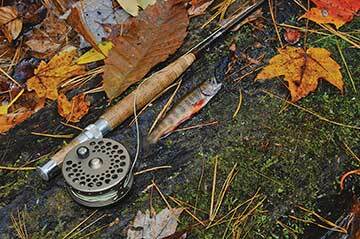 The individual project descriptions and overviews in this article were compiled by SCW editorial staff with input and assistance from biologists and other staff within the DNR's Freshwater Fisheries Section.